Starting in July 2017, our new society was bursting with energy. We, as 2nd board to be, needed to harvest the yield the first board left us. Moreover, we need to invest our power in order to create more value. Since the society was yet to be established, this came with the risks. Hence the name “Speculate to Accumulate”. Did we get enough gains out of our year? Definitely! In line with the first board, “Fake it till you make it”, we started the TU/e introduction period for new students with the enthusiasm and drive to convince everyone and anyone to become member of our society. We weren’t alone. With the intro committee, we had additional reinforcements to make it a succes. Our newly designed B&R polo’s and banner draw extra attention towards our stand. 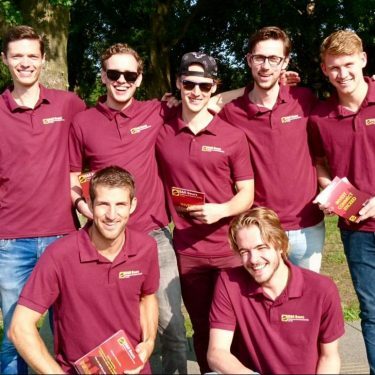 Armed with the investment game, ably crafted by our new treasurer Luc Tissingh, we were able to raise a lot of interest for our society. This was only the beginning. The real work started during our introduction lectures. Luna was not completed then, so introduction lectures took place in the old college rooms of Gemini. Here, in three independent lectures, we explained our society, the basic rules of investing and touched the surface of analyzing. After this, our current and prospective members needed to bike all the way to Miller Time, Stratumseind. In order to give them a reason to join us, we came up with the idea to give out food at a discount, which we picked up by ourselves at places like Happy Italy or SoHo. A successful first collaboration with Studium Generale filled the complete Blauwe Zaal of Auditorium with people interested in “The value of money”. Our president Robert van Dongen made a terrific speech connecting it to our association. After the introduction lectures and drinks, we managed to raise our member count to 108. With these club of fresh members, we started to explore all facets of investing. 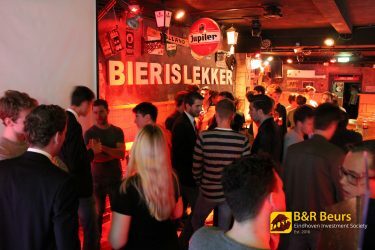 With the support from our brothers and sisters in Rotterdam, their bar serves lovely steak by the way, we started the sales of the B&R Investment Guide. 2017 ended with the peak of the cryptocurrency hype, which many of our members observed from both in and outside the bubble. 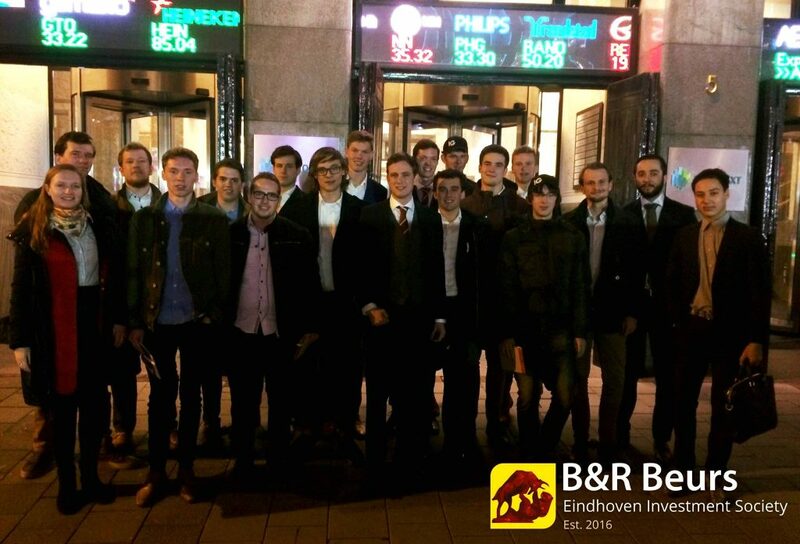 Our lecture of IG at Beursplein 5 gave our members the insights of mayor parties in the financial world. With the karting tournament, we sped up the development of our community. 2018 kicked of with the Rabobank New Years reception, which was possible thanks to the effort of Luuk Broekhaus. Rabobank told us their expectations of the markets, after which we popped the champagne in the cellar / living room of Luna. With the successful party afterwards, we knew 2018 would be a great year. The first results of our investment competition were able to prove that investing is beneficial, fueling the enthusiasm of our members. The first months of this year also marked the end of the first area of B&R Beurs Eindhoven. With the opening of Hubble Community Cafe, we started the drinks at this brand new bar. As one of its very first users, our drinks grew in symphony with this new establishment. This meant we needed another committee. With B&R Beers, we were finally able to go short on longdrinks. Under the supervision of secretary Roeland van Delft, who became officially noted on Hubble operating license, we build out our networking pillar, giving partners and members a opportunity to discuss the financial world in a informal setting. Members started to draft beer and other refreshments at this bar after 20:00, making it an important part of our society. The year ended with the now traditional end BBQ. 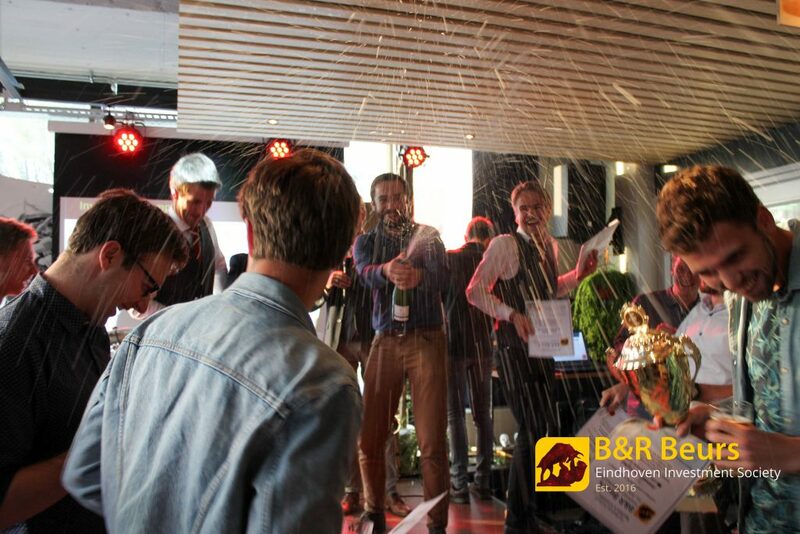 LH Investments won the investment competition with a return of 18%.